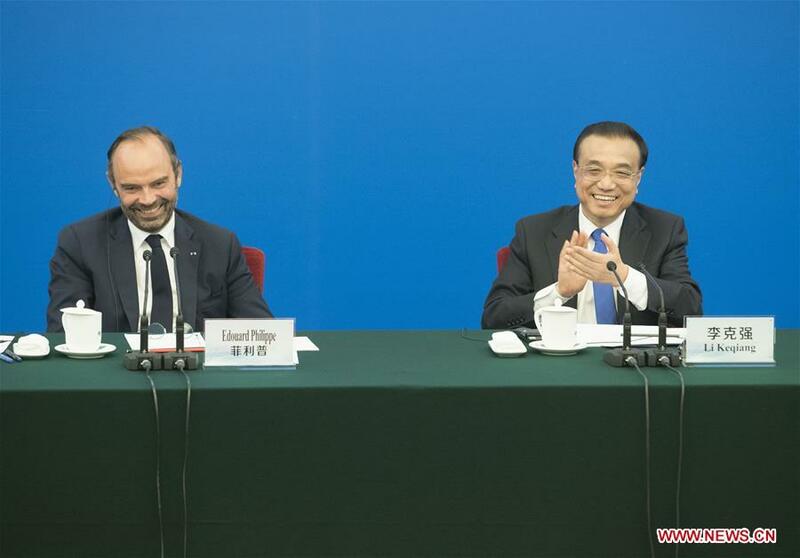 Chinese Premier Li Keqiang and his visiting French counterpart Edouard Philippe attended a symposium Monday that gathered executives from more than 30 Chinese and French enterprises. The two leaders listened to speeches by representatives of the entrepreneurs and talked with them. The entrepreneurs come from manufacture, energy, finance and other industries. Li said the two countries' enterprises have cooperated for a long time and enjoy great development potential. "China will open its door even wider to the outside world," Li stressed, adding that this will safeguard and promote the free trade system and provide opportunities to companies worldwide. "French enterprises are welcome to seize the opportunity and extend their cooperation with China," the Chinese premier said. Li said China would "open its arms" to welcome deeper cooperation with the French enterprises in high technology. "China will strictly protect intellectual property rights and will never allow forced technology transfer," Li said. "China will expand the scale of personnel exchange with foreign countries, and provide more convenience for foreign business travelers to China, including those from France." Li said he belives that the two governments will address concerns raised by enterprises and make it possible for smoother cooperation in a wider range of areas. Philippe said the French side is pleased with the achievements made by Chinese and French enterprises in their cooperation. France supports frank and sincere discussion which serves to find solutions and push forward cooperation, he said. The French PM said his country welcomes more investment from China, expressing the hope that businesses of the two countries will open new fields of cooperation with medium and small-sized enterprises playing a bigger role.